An increasing number of cancer drugs are being priced out of reach of patients who need them due to escalating prices charged by pharmaceutical companies. The Cancer Drugs Fund was a stop-gap solution for this but has only exacerbated the problem of high drug prices that it was set up to help with. Patients need access to the best available drugs but we can’t just keep writing out cheques to drug companies every time they want more money – they are holding patients to ransom and already make jaw-dropping profit margins. To create a more sustainable solution, we need to fix the causes of high drug prices not the symptoms. Why Are Cancer Drugs So Expensive? Cancer drugs cost a lot of money to develop but could cost much less if we used our money, knowledge and skills more wisely. Here are three big reasons why cancer drugs are unnecessarily expensive. It is not unusual for new cancer drugs to be sold at prices in excess of £50,000 a year, even though the costs to manufacture them are tiny. The reason for this is that a big mark-up is added to the price to cover the cost of developing the drug. This mark-up typically makes new cancer drugs 4.5 times more expensive than older drugs whose patents have expired. However, the current drug patent system allows drug companies to continue to charge this mark-up long after R&D costs have been recouped. 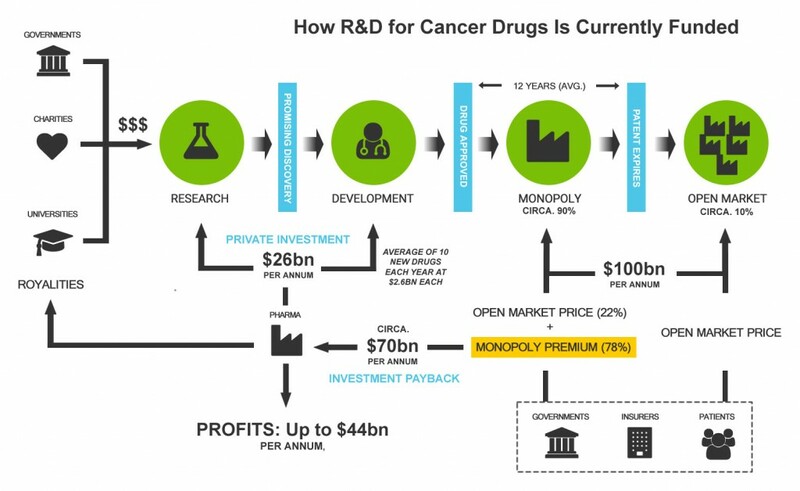 The following diagram illustrates how the current system of funding cancer drugs works. The process to develop a new drug starts with research in laboratories, funded partly with public money and partly from the private sector. Patents are registered for promising discoveries and these are then licensed to pharmaceutical companies to investigate and develop into drugs that are proven to be safe and effective. Only around 12% of drugs that are investigated end up being approved, so there is a high failure rate. Drug patents are usually awarded for 20 years and typically the first 8 years of this is spent developing and testing the drug in order to gain approval to market it. During the remaining 12 years, the drug company then has a legal monopoly on the drug, enabling it to charge a premium price. This monopoly premium is used to cover the costs of researching and developing the drug, including any royalties owed to universities involved in discovering the drug. 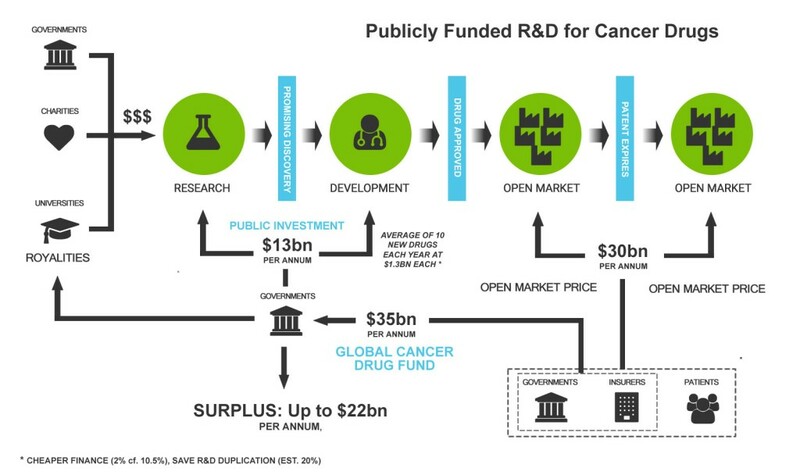 Globally we spend around $100bn on cancer drugs and around $70bn of that is the mark-up added to cover R&D costs. However, this is significantly more than the estimated amount actually spent on R&D by drug companies. On average over the last 10 years, only 10 new cancer drugs have been developed each year at an estimated cost of $2.56bn each – a total of $25.6bn per year, less than half of the amount we pay for R&D! Drug companies are clearly abusing monopolies of supply to produce exceptional returns from their R&D investment, despite the consequence being premature death for many people. This is even more appalling given that public donations and taxes have contributed to the discovery and development of drugs that large numbers of people can’t access. The huge profit margin being made by drug companies is certainly one reason why cancer drugs are so expensive. The latest industry estimate for the average cost of developing a new drug is $2.56bn, which includes an uplift to reflect the cost of failed experiments with other drugs. But around 40% of this cost is just a finance charge – effectively the cost of borrowing the money needed to cover costs before the drug starts generating sales revenues – so the finance rates have a huge impact on the prices charged for cancer drugs when they come to market. As we are relying on pharmaceutical companies to develop new drugs, the finance rate is the cost of capital of the pharmaceutical industry, which is a whopping 10.5%. It is like going to a pay-day lender to get your mortgage! We could be using much cheaper money, so the use of expensive finance is another reason why cancer drugs are so expensive. One final big reason why cancer drugs are unnecessarily expensive is the huge amount of duplication in drug development, resulting in a raft of ‘Me-Too’ drugs that add no benefit to patients. This happens because drug development is being undertaken by private companies all competing for a slice of the market. A 2014 study into the lack of innovation in new cancer drugs found that 74% of new drugs being developed by 9 of the top 10 drug companies were very similar to drugs being developed by their competitors. What a ridiculous waste of our money! But duplicated effort isn’t just wasting money, it’s also wasting valuable research knowledge. Drug companies are reluctant to share information that could further optimise the use of funds, as they are competing with each other. Furthermore, as the bulk of the direct costs of developing a new drug are the costs of clinical trials, which are duplicated in different countries across the world, there is is also a big opportunity to save costs by coordinating international trials – is an American man really likely to respond differently to a cancer drug than a British one? So, duplication is another major reason why cancer drugs are so expensive. The current system for developing new cancer drugs is hugely wasteful and inefficient. Prices for new cancer drugs could be much lower if we used our money more wisely by publicly funding R&D. This would require the establishment of a Global Cancer Drug Fund and the participation of all the main countries that make up the global sales for cancer drugs. However, it has the potential to deliver much more for less money, cutting costs by half and still leaving a huge surplus. Under this model, a global fund would be used to pay for the costs of developing new cancer drugs. Once approved, new drugs would be immediately available on the open market at much lower prices, enabling millions more people to benefit from earlier access to new treatments. Governments and insurers would pay into the global fund instead of paying a premium price for new drugs, resulting in a 50% cost saving, which could be reinvested into cancer research. This fund would then be used to pay for the costs of developing new cancer drugs, which would be significantly lower, as finance charges would be based on public borrowing rates of around 2% instead of the current 10.5% rate for private finance and because of eliminated duplication, conservatively estimated at 20% in the above illustration. Perhaps the most significant benefit though, is that without a profit motive, investment in new cancer drugs can be optimised to maximise health benefits not financial benefits, so cancer patients stand a much better chance of getting what they really want – safer and more effective cancer treatments. It makes sense – to anyone not profiting from cancer. The Dying for a Cure campaign is calling for a major overhaul of the way cancer drugs are developed to put the needs of patients before the needs of drug company shareholders. Please help by signing our petition. No Replies to "Cancer Drug Costs Could Be Halved"